Analogy/Critique From The Biafra Post Mobilization Officer March 01, 2018 The prelude of this heavy analogy /critique is inconsonant with the mess an average Igbo-Biafran had conditioned themselves to live with; the findings revealed here are made possible after a great deal of search, study and intensive research on the Igbo cosmology as a unified people, race or colour. The Igbo man is one person/ race who finds it more pleasing destroying every artefact that has to do with her existence as a people. For way too long an average Igbo-Biafrans have been living a life of pretence and denial of her ancestral linkages and what have you. In a more unique tone, this study will look at the Igbo race before the coming of the Europeans into Africa, the illegal human trafficking of Igbo people and to an extension Africans at large called "slave trade"; the desecration of our holy and worship places as a result of white man's indoctrination; the abolishment of our traditions and culture known as " Odinala and Omenala". The way an average Igbo-man by extension Biafrans wants everything relating to them be coated and polish with alien culture and abandon hers. The Igbo man before the coming of the British by extension the Europeans had their unique ways of settling and marrying their daughters out to their respective husbands; this critique essay will refer us back to the dark and none computer ages of male circumcision which is part of the Igbo-man heritage. The Igbo-man and by extension Biafrans had a developed political system which is composed of the "Onye isi Agbara / Onye isi Arushi/ Onye isi Alusi" who sees to the divinity of his people by interceding on the people's behalf by proper consultation of Chukwu Okike Abiama to which till this day we call it deity because Igbo-man has been brain washed dead. Going by the definition of what we call political settings which gives birth or credence to what we know as politics today, the Igbo-man by nature as gifted by the Almighty Creator who himself is Creation "Okike" is no exception to that a Republicans or Democrats; in the Igbo-political fora the Igbos had "the Ofor holders [Sceptre] of a particular unit that make up an average family and by extension a unified community" to which up to date you see such staff of office in the Senate and elsewhere, the Nze title holders, the Ozor title holders and the "Ndi Obodo" or "Ndi Ohaneze" - masses. The Nze title holders and the Ozor title holders are viewed today as individuals that make up the upper house and lower house in any given Igbo Community /Town whereas the "Ndi Obodo" or "Ndi Ohaneze" we see today are seen as the masses that formed the Community or Town in question. Then in the area of socialization, entertainment the Igbo-man have what they call age grades [peer groups], music groups, masquerades for entertainment to which till this day the Igbo-man had condemned hers and to some extent abolished her entertainment sector whereby promoting the white man's masquerades known to be "Halloween" reason because the white man polished theirs to be or look superior over what an Igbo-man have back at home. AdSense In the words of Mr. Odiranchinma Ezeobi wordings and making reference to his work on traditional and white weddings posited that "If you don't believe in the equality of all cultures then believe in the supremacy of my culture over all" I wish that someday our people will realise that this two weddings are traditional weddings representing two different people. "The day we start valuing what we have, the white men will start placing value on our inheritance" those were the words of Odirachinma Ezeobi a scholar that I cherished his observation on this issue of white weddings that so many of our Igbo young ladies have killed themselves to acquire. The white wedding is the white man's way of tying knots in their own culture while ours - traditional weddings- is the Igbo-man way of tying knots which require the blessings of both family; even in the so-called Christian marriages a woman will not be given out in marriage to her new husband unless the bride's parents approve of it; but the European interference with the Igbo-man has made him to view his progenitors' way of marrying a woman as inferior thereby promoting the white man's weddings. I have even seen on many occasions where some Igbo traditional weddings were carried outside, not in Igbo land; no kith and kin was invited leading to the manipulation of our heritage as a people, after the traditional weddings do you also know that when the groom parents and his kinsmen visit the bride's home as tradition demands, the parents to the bride will perform somewhat of ritual or tradition before the both family's can eat from one plate as a form of unification where a far traveling in-law's kinsmen can sleep over night while on a far journey then tomorrow or days ahead he continue with his journey thanking his in-law while departing. The Igbo-man by extension the Igbo-Biafrans no longer return the relic of their dead one back home for proper burial ceremony rite and appeasement of soul; an average Igbo-man put every blame on his village people, since the Igbo-man embraced the white man's do and don't way of life, what has it stopped? Are we not dying, are we not being marginalized? The hoax made about the Igbos killing of twins was doctored by the Europeans to paint the Igbo-man history dark; let me drive you through this school of thought, do you know that when a twin dies in Igbo land the other half living twin do not attend the half deceased burial neither will he or she eat whatever items used to host the visitors that graced the burial. How come that the Igbos kill twins and still maintain this culture as a form of tradition and also as a process of keeping total abstinence to pay homage and respect to his or her left deceased. Since the coming and disembarking of the Europeans from Africa and to the formation of Nigeria, the Igbo-man seems not to know nor understand his left from his right; mainly in the area of Nigerian politics an average Igbo-man wants every other ethnic nationalities to see him as a more detribalized nationalist before his own Igbo-race. 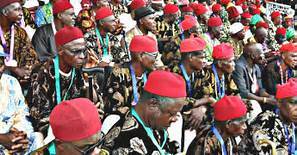 This set of misguided Igbo men who arrogates to themselves elders of thoughts or elites immediately after the war ended are shamefully missing the track in the sense that they can offer their kiths and kins for paltry sums. No matter how long a man pretends he cannot love a stranger more over his own flesh and blood. Yes acculturation is well and welcome development but one do not necessarily need to trash all her heritage for a foreign culture that has no meaning to your being, existence as a people. Self determination embarked upon by Nnamdi Kanu and his Indigenous People of Biafra is to restore the Igbo-man lost identity and heritage as a people what we see instead cheer him up and guide him with words of encouragement, the so called elders and governors wants him dead so as to keep an unhindered flow of their crumbs coming from Aso-Rock; since we took a leaf from this alien culture what has it profited us? The foolish Igbo-man of today wants everything about his history, anthropology; forget about the nonsense the white man told our forbearers that they brought civilization to us, how can they bring civilization to us when the Igbo-man have a unique way of writing and communicating called nsibidi. The Igbo man unique way of writing and communications was obliterated, denied from us because the British wants everyone to believe that they actually brought education and civilization to you hence everything about the Igbo-man, what he does must be Westernized.